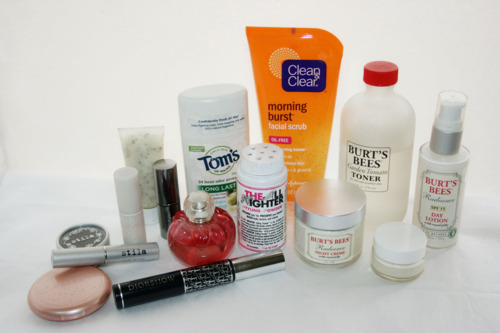 I thought I would do something different today, and give you a look at some of my favorite beauty products that I use. I’m still playing around with a few different products, but for now- this is my routine. As far as skin care, I keep it pretty simple (I think, at least). I’ve been using Burt’s Bees for awhile, and absolutely love it. Clean & Clear Morning Burst I start out with this face wash. It feels good and really does wake me up in the morning. 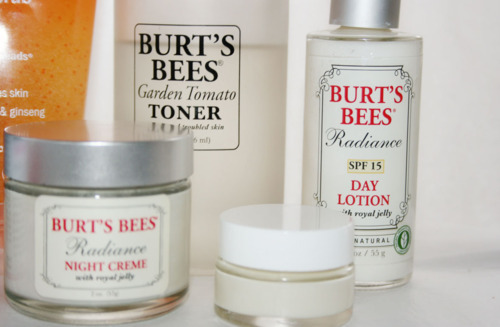 Burt’s Bees Garden Tomato Toner - I especially love this in the summer. It cools me down. Burt’s Bees Radiance Day Lotion - my face can get pretty dry, and I’ve never had a problem with this lotion feeling too heavy, or anything. Works perfect. I start by removing any makeup with basic makeup remover pads (not pictured). Burt’s Bees Radiance Night Creme - I’m not really sure if this does anything, but I like to think it does. I don’t really wear much makeup. Most days its just mascara, a little lip color, and a bit of cover up (if necessary). If I feel like it, I might do a little eye liner and color on my cheeks too. Stila All Over Shimmer Duo - I like this because its 2 colors and I can use it on my cheeks or eyes. Stila Eyeshadow - I used black eye shadow as eyeliner. I like a smudgier look. Diorshow Mascara - I. Love. This stuff. Seriously, best mascara I’ve ever tried. I’ve used it for a couple years now, and I doub;t I’ll ever use anything different. 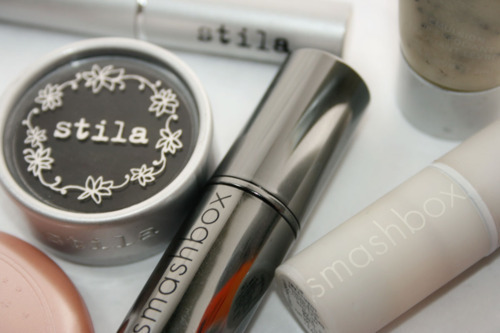 Smashbox Emulsion Lip Exfoliant - I have a dry lips issue. I feel like this stuff actually helps, and its minty! Smashbox Lip Treatment - I’ve replaced my chapstick with this and I love it. Although I still use my Burt’s Bees chapstick sometimes. Smashbox Photo Finish Lipstick - I’m kinda new to lipstick (because of my dry, flaky lips), but so far I like this. The one pictured is Delightful (sheer berry). But I just got Legendary (true red) the other day and it both excites and scares me at the same time. The All Nighter Brown Hair Powder - I don’t shower everyday, and I use this powder to make my hair look a lot less greasy than it actually is. Nina Ricci ‘Nina’ Perfume - So pretty. Both fruity and floral. Tom’s deodorant - Confession- I bought this deodorant solely based on the fact the Linda uses it. True story. I was using Dove deodorant, but I was out. And when I went to the store for a new one, and was standing in front of all of them, I spotted Tom’s and recognized it from Linda posting it in her own beauty routine post. So I bought it. So thank you Linda, for influencing both my style, and the smell of my armpits.